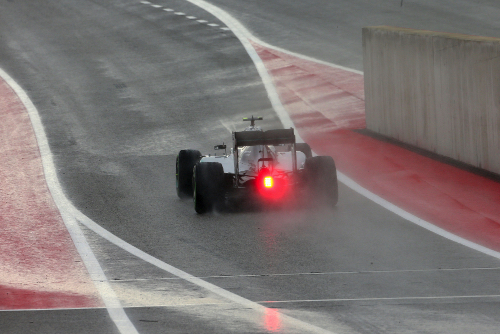 Nico Rosberg ruled in the rain in Free Practice 1 as he clocked the fastest lap time in his Mercedes. Red Bull teammates Daniil Kvyat and Daniel Ricciardo rounded out the top three. While the track dried out as the session went on, it never got to the point where the drivers could switch to slick tyres. The line-up for the weekend was: Mercedes Lewis Hamilton and Nico Rosberg. Red Bull Renault Daniel Ricciardo and Daniil Kvyat. Williams Mercedes Felipe Massa and Valtteri Bottas. Ferrari Sebastian Vettel and Kimi Raikkonen. McLaren Honda Fernando Alonso and Jenson Button. Force India Mercedes Nico Hulkenberg and Sergio Perez. Toro Rosso Renault Max Verstappen and Carlos Sainz. Lotus Mercedes Romain Grosjean and Pastor Maldonado. Marussia Ferrari Will Stevens and Alexander Rossi. Sauber Marcus Ericsson and Felipe Nasr. The only reserve drivers in FP1 was Raffaele Marciello in Nasr's Sauber. Rossi is the first American driver to take part in his home grand prix weekend since Scott Speed at the 2006 USGP at Indianapolis. "The reaction of the fans has been very positive, which is what we wanted to see," the Californian said. "Of course there is pride that goes along with it, but that started in Singapore and Japan as well. Obviously to be here at home means a big deal, but at the same time we have a job to do and very clear objectives to meet. "I'm looking forward to it; there are a lot of friends and family that will be coming this weekend. But I think once you get in the car and on track you appreciate the fact that there is a bigger picture." The fans who were at COTA on Friday were going to get wet as rain showers roved through central Texas. More rain, much more rain, was forecast for Saturday. The 3.425-mile (5.513-km) 20-turn track was wet as the 90-minute session began. Ericsson was the first out. 12 minutes into the session, Ericsson set the first time: 2:01.702. He was the only driver doing flying laps in the first 17 minutes until Marciello turned a 2:01.855. Then Rosberg went around in 1:55.102. All the drivers were now using the intermediate Pirelli rain tyres. 20 minutes into the session, Massa had a quick spin at Turn 9. Then Raikkonen went second quickest with a time of 1:56.884. But then his engineer radioed that the Ferrari had a potential brake problem and he should pit. 29 minutes into the session, nine drivers had set times and Vettel was now second behind Rosberg. So the order was now: Rosberg, Vettel, Raikk‚nen, Nico Hºlkenberg (Force India), Button, Marciello, Ericcson and Rossi. 30 minutes into the session, Ricciardo went into second with a 1:55.592. 34 minutes into the session, Kvyat grabbed second place. 40 minutes into the session, the top five were: Rosberg, who had now improved to a 1:53.989, Kvyat, Ricciardo, Hamilton and Verstappen. Sainz, Vettel, Raikkonen, Perez and Alonso rounded out the top 10. With 35 minutes remaining in the session, the top 10 remained unchanged. With 32 minutes remaining in the session, only Rossi, Stevens and Button were on track. With 26 minutes remaining in the session, Massa moved into ninth. With 18 minutes remaining in the session, Rosberg remained on top of the times. The session wound down with the drivers doing long runs on the intermediate tires rather than going for quick lap times. But that didn't stop Alonso from taking over ninth place, and Bottas tenth. The top 10 were: Rosberg, Kvyat, Ricciardo, Sainz, Hamilton, Vettel, Verstappen, Raikkonen, Alonso and Bottas.